Beauty guru culture has revolutionized how we wear makeup. That’s a good and bad thing. Don’t get me wrong, the surplus of makeup tutorials out there on the internet have taught me so much of what I know about makeup. But I have also picked up some bad habits and methodologies along the way. Of course, I’m not blaming the beauty community. These beliefs manifested from my own shortcomings, and I want to make a conscious effort to abolish them. These are things that have changed the way I go about my beauty routines, and make me behave in ways that don’t really suit my personal style. I feel like it is time to address these things because many of these habits totally go against the ideology of The Millennial Maven! Maybe you have unwittingly fallen into some of these habits or beliefs too. If so, let’s change that! I honestly don’t know of a single beauty YouTuber who says they really like a good light coverage foundation. It’s always full coverage, Full Coverage, FULL COVERAGE! And so it slowly became ingrained in me that a mask of full coverage foundation was the only way to look like I had proper makeup on. Makeup should be an enhancement, not a wall you hide behind. Your natural skin is beautiful. Use concealer to cover the spots that really need coverage, and let the rest of your skin shine through! “Pigmented. Pigmentation. So pigmented!” I would say this is the most commonly used word it makeup reviews and tutorials. It’s not necessarily a bad thing. 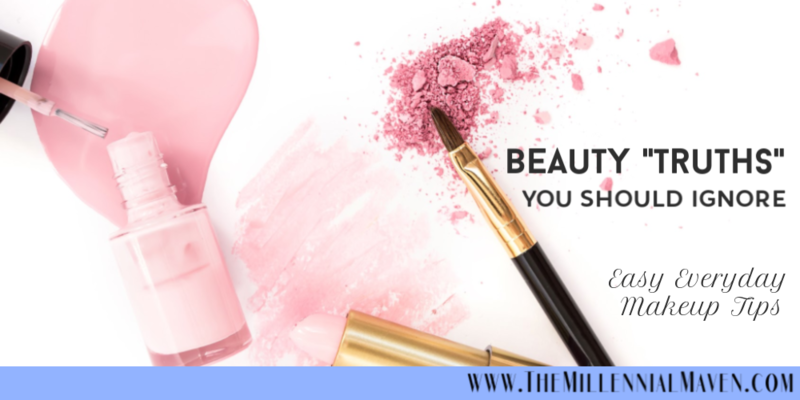 After all, why would we want makeup that doesn’t appear to do anything…? Or perhaps, that’s exactly what we need. After years of watching eyeshadow reviews, I basically had one qualification for eyeshadow. If the color showed up as opaque as house paint on my eyelids, it’s good. If the color gave me a watercolor-like wash, it was BAD. Don’t get me wrong, I love a highly pigmented shadow as much as anyone, but I don’t think there is anything wrong with a lighter wash of color on your lids for everyday wear. Heck, Glossier even built an entire brand on the concept! Remember when Michelle Phan once said that your eyebrows should look like sisters, not twins? Well, that concept went right over my head… erm, eyebrows. I’ve spent the last four years or so obsessing, losing sleep, over my eyebrows. I tried and tried and failed and tried again to draw them on perfectly evenly every single time. I thought that was the only way to look like I knew anything about makeup. Recently I’ve been much more into light & natural makeup looks, and “on fleek” eyebrows don’t exactly fit in with that aesthetic. These days, I simply outline the bottom edge of my brows to make them match as much as possible. Then I blend my brow pomade up into my brows to fill them out, and leave the top edge alone. This technique gives great definition without looking overdone. If you’ve seen how the full coverage makeup-ers go ham with their concealer, then you know what I’m talking about. I was under the impression that that’s how much concealer one needs under their eyes, and all over their face, for that matter. With my war paint” striped on, I would blend, blend, blend and then powder, powder, powder, and wonder why I looked like an under-baked cinnamon roll by the end of the day– dry in some areas, sticky in other areas, and crackly all over. I digress, concealer is best used sparingly where you really need to cover something. Less really is more when it comes to concealer. I think the reason why I have been notoriously bad at skincare is because I was just overwhelmed by what I thought I needed! I fell into the mindset of thinking “if I’m not going to go through all the steps, then why even bother moisturizing?” That sounds absurd, but it is honestly how I felt. Now that I am getting older, I really wanted to start taking better care of my skin. But I still didn’t have it in me to spend a ton of time or money on a whole cabinet full of products. My current daily skincare routine is only three steps long. Occasionally I throw in a face mask or pimple treatment, but that’s it. My skin looks healthier than ever, no nightly 45-minute commitment necessary. Okay, I’ll be honest, nobody has tried to tell me that using foundation with SPF halts the need for sunscreen. Except maybe the foundation companies themselves. This one was born out of my own laziness. Folks, please wear a sunscreen under your foundation. You may not notice a difference right now, but you’ll thank yourself later in life. My hair is naturally wavy and frizzy. It’s not straight enough to be easy to control, nor is it curly enough for that perfectly messy-chic “I woke up like this” kind of look. Either way, my hair wasn’t good enough, according to me. It took me a long time to accept my hair for what it is, and stop trying to change it in the name of “looking acceptable.” Seriously, as long as it’s brushed and neat, there’s nothing wrong with my hair. Likewise, there’s nothing wrong with yours, either. Hair styling should be something you enjoy doing, not something you feel like you have to do so that the world will accept you. Anybody remember Anjelah Johnson’s Nail Salon skit? It was around then that I fell under the impression that I needed long nails in order to be attractive. But there was a problem: I wasn’t able to wear my contact lenses. When forced to choose, the contact lenses won, but that didn’t stop me from feeling quite disappointed with my practical short nails. I don’t know if it’s the minimalist in me who somehow feels I need less fingernail mass in my life these days, but I’ve actually been enjoying my short nails recently. If you love long nails, then that’s cool, but I really suggest giving shorter nails a try. Seriously, life is so much simpler. In the age of gigantic makeup collections, my little collection felt highly inadequate. The thought of *gasp* wearing the same makeup everyday seemed as outrageous as never changing my underwear. In my more minimal mindset, I’ve been quite happy just reaching for the same handful of products that I know work well for me. 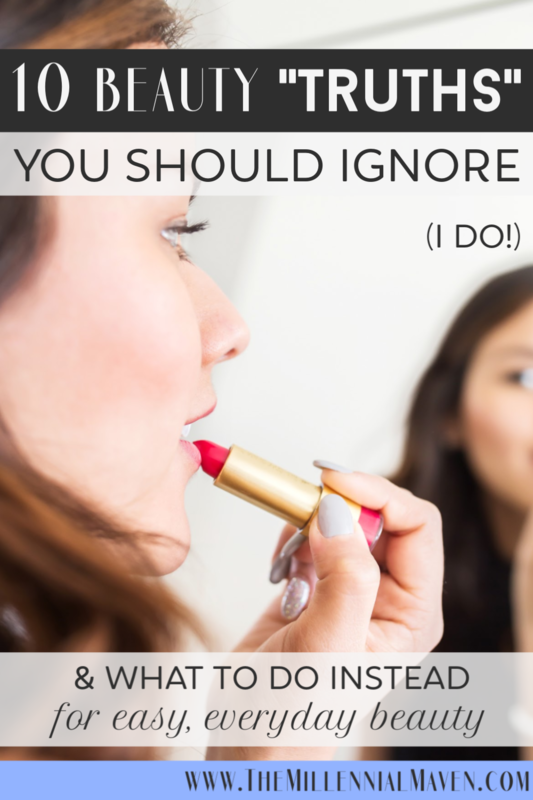 It takes the guesswork out of getting ready when I need to get moving in a timely manner. Plus it also makes the times when I do get to experiment all the more fun. I used to hang onto people’s every word when it came to products and techniques. If someone said the product was good, then I’d buy it, and visa versa. I spent so much attention and money on stuff that other people liked that I didn’t have a chance to get to know what I liked. My advice: look to influencers for inspiration, but think about whether their advice suits you before diving in head first. Getting to know yourself takes work, but you’ll feel so much more at ease once you know exactly what serves you and your life.